When I opened the cupboard to see roots growing out of my sweet potato, I knew it was time to make some muffins. 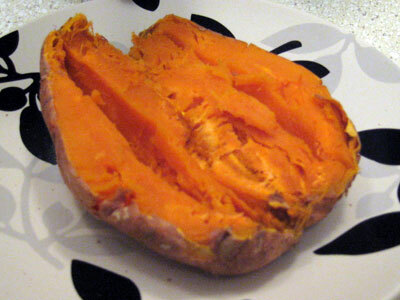 Puncture the sweet potato several times and microwave it for about 8 minutes. Scoop out the orange part and mash it in a bowl. Mix it with the rest of the ingredients. 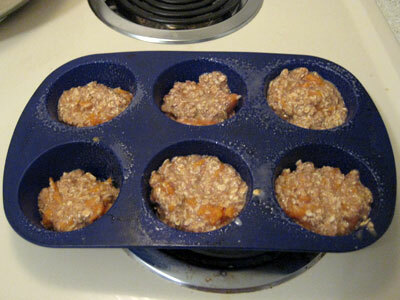 Grease a muffin pan and spoon the mixture into the cups. Bake for approximately 30 minutes. 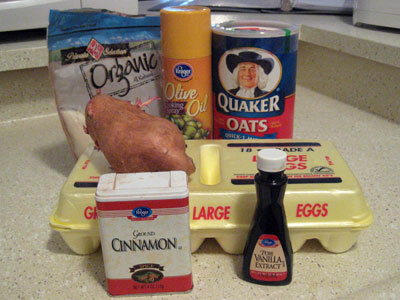 This is a quick and easy recipe which is high in carbs and protein. I used to mix it up before I did weights and they’d be warm and ready at the end of my routine, ready to refuel my muscles. I usually halve the recipe because I’m prone to eat the whole batch. Note: I’m avoiding artificial sweeteners right now, so for this instance I subbed the Splenda with real sugar. First I cut off all the roots growing out of the sweet potato, apologizing to the young sweet potatoes that would never be born as a result. Then I punctured it a few times and nuked it in the microwave for about 8 minutes. After slicing it in half, a sweet potato is a yummy treat in itself, particularly if you sprinkle a bit of brown sugar on top. While that was cooking, I had more than enough time to measure and mix together the other ingredients. Then I scooped out parts of the sweet potato and mixed it into the batter. I tend to get impatient and sneak little bites of the batter, which is why I should probably chew gum while I cook to impede such urges. Then I scooped out the batter into my silicone muffin pans, filling it basically to the top. These muffins don’t really rise, so they’ll be about as big as you fill the pan. BTW, if you’ve never used silicone muffin pans, they’re very cool. They’re bendy, easy to wash, and don’t conduct heat. About 25-30 minutes later, I pulled them out of the oven and arranged them nicely on a plate like this. Normally, however, I skip the pretty stuff and just devour them straight from the pan while they’re still hot. The word “muffin” is a bit of a misnomer here because I don’t use any flour. They’re more like a cross between a muffin and an oatmeal cookie, sort of tough but still tasty. These are fairly calorie dense, so go easy on it! OMG these look so good – and believe it or not I’ve never even bought a sweet potato in my life, although I love them and usually eat them at Thanksgiving if someone else has made them. :) You said they were calorie dense so I wondered how many calories they are so I can figure WW pts. :) Thanks again. These look yummy. I bet something similar using winter squash (which is in season and cheap right now, at least in the northern US) would also be delicious. I am pretty sure that I have a couple of sweet potatoes that look like yours in my pantry right now. I’ll have to whip some of these up! I’ve got my lap top in the kitchen & I’m going to follow your recipe step by step. I wanted to bake something today anyway and I too have a transforming sweet potatoe that needs to be devoured. I just noticed that I spelled potato with an “e”. Yikes. Just call me Dan Quayle. The roots actually look like a very tiny person’s fingers. According to Diet Diary, which I have on my phone and find incredibly helpful for eating actual foods (that have no nutrient information printed on them), that list of ingredients (with Splenda) comes to: 1005 calories, 150.2g carbs, 17.4g fat, 24.1g fiber, and 55.6g protein. Not bad. @Kelda – Thanks for calculating that, Kelda! I’m thinking I might try this, or maybe adapt it into a slightly different recipe (which is what I always do with other people’s recipes so don’t be offended!) Does this make 12 muffins or 6? I’m thinking you could use quinoa flakes in place of some of the oatmeal and it would add protein instead of quite so many carbs. He’s not exactly organic I don’t think but it might give you some inspiration for food things. She’s a foodie and one of my hardest battles with food is that I hate it (so, why i stuff my face with it, I have no idea, still workin’ on that one!) so I’m trying to change my relationship with it… trying to enjoy the taste of food, instead of just filling my face with food just to subsist. @Kalyn – It makes 12 muffins. Let me know how yours turns out! These sound interesting. If I substitute regular oatmeal for gluten free, I can eat this … hopefully these are yummy! 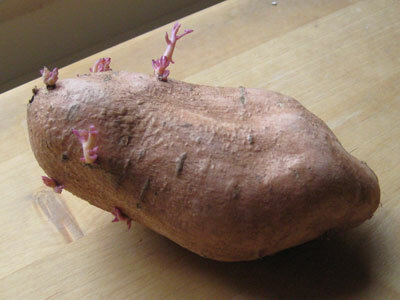 The sweet potato with the roots coming out like arms looks like a big fat mouse in that pic. That’s my first reaction. Now for the muffins, those sound delicious! I will definitely be trying them out. I don’t use Splenda so I don’t know how the conversions work, when you subbed real sugar did you use the same amount as the amount of Splenda stated in the recipe? try using a bit of honey instead. raw honey. mixed with the cinnamon the GI factor will be lowered. PLUS you get all the nutritional benefits of the honey. perfect combo!! @earthmamma – That sounds like a good suggestion. How much honey would you suggest to replace the sugar? YUM! I’m also a ginormous fan of the silicone muffin pans. Thanks for the recipe! 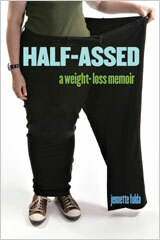 @April – 1 cup of Splenda equals 1 cup of sugar. They bulk up the Splenda with some filler so you can do a 1 to 1 conversion. 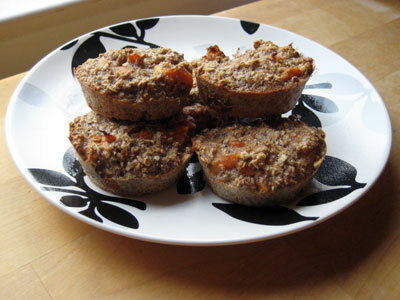 I put the ingredients into the WW recipe builder, and it turns out these muffins are only 1 point each! (I calculated this with the ingredients making 12 muffins). What a great treat – I think I’m going to make these for my book club this weekend! @April – You can also do a 1/1 conversion of honey to sugar, although some people like to go a little lighter on the honey, often for texture reasons. In these, it should be a pretty easy (and flavorful) substitution. That recipe sounds delicious I will have to try it out for sure! You know its gotten bad when, despite the fact that you’re chewing gum, you sneak batter! This is too funny – I just took a picture of a similarly-sprouted sweet potato in my kitchen so I could blog about it. Yipes! I whipped the egg whites separately (‘cuz air has no calories) then folded them into the mix to made 30 cookies. Yum. @BC – That sounds very interesting. I might try it next time. I made these last night but I substituted half a can of pumkin (7-8oz) because I did not have sweet potato. 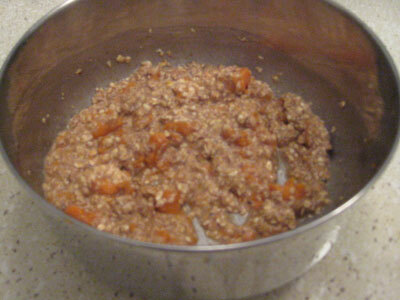 I also added a tablespoon of ground flax. They’re yummy! My husband thought they needed to be sweeter but I love them. Great for breakfast. 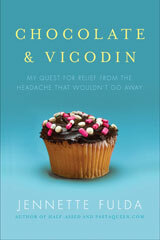 I only made 6 muffins from this recipe though! Ooops!